hosting a collections party here. and of vacations at the beach. in first image at top. antlers like the one at top. (This is not me btw. style away and even cut her hair!). hug you with every post! What are you collecting these days? Next Post DIY: Make Your Own LIMONCELLO! You've picked your beach colors again they're going to become your signature colors. I'll have to keep my eyes open for antlers for you since the bucks lose them before winter and we have a young buck hanging out in our field these days. I used to collect everything but you reach an age wherre it becomes one more thing to dust but I still collect thimbles. Lovely collections. 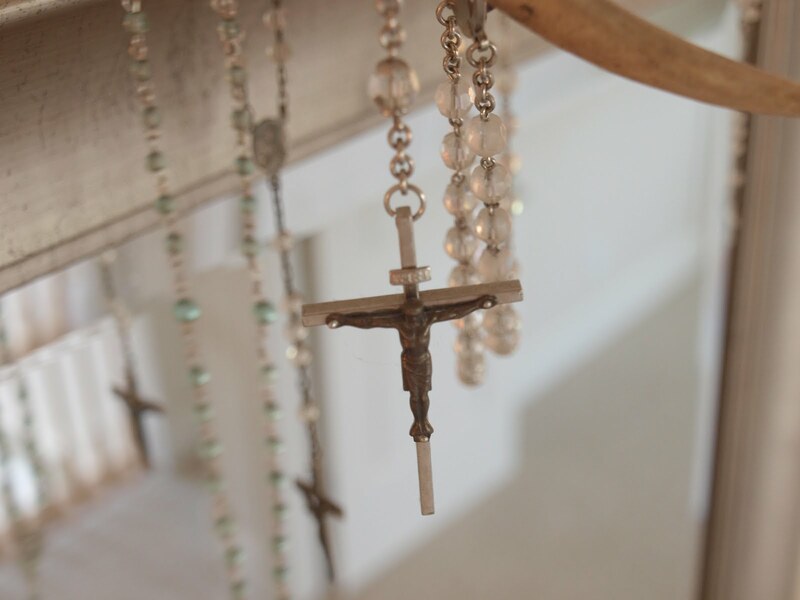 I especially like the rosaries. 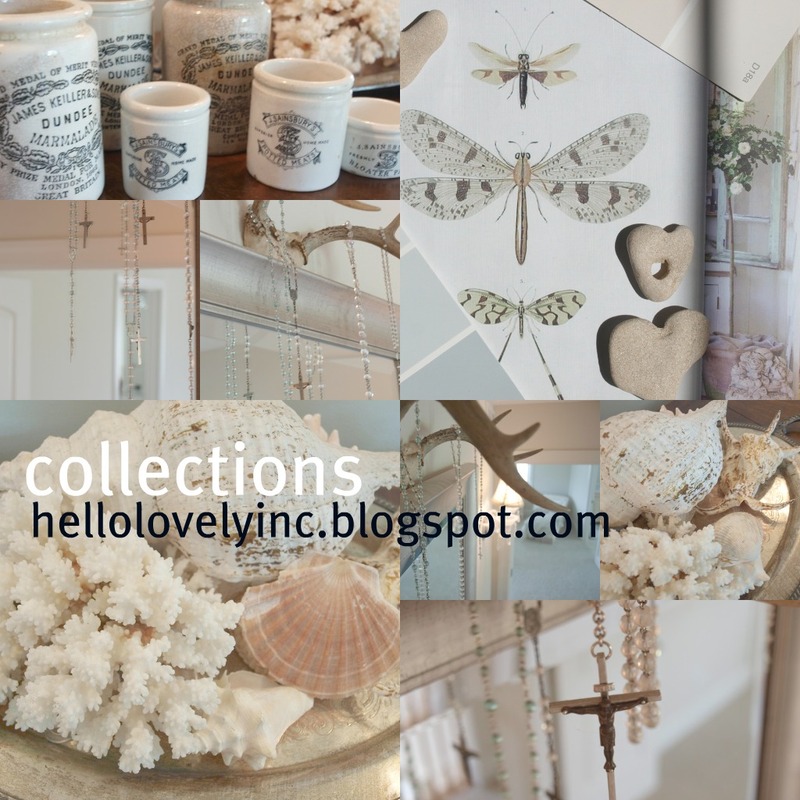 Beautiful shell collection and lovely photos. 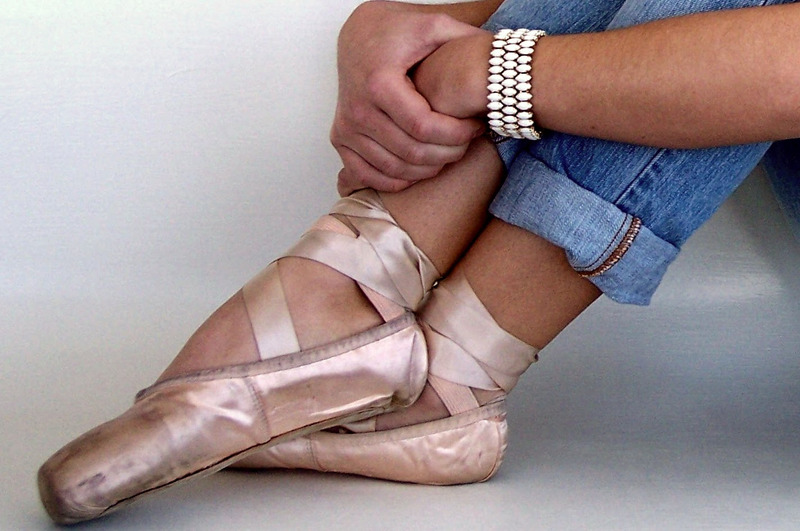 I wish we had saved all my daughters ballet slippers. Young moms out there learn from me- you will be glad you saved them. Your collection mosaic is beautiful. 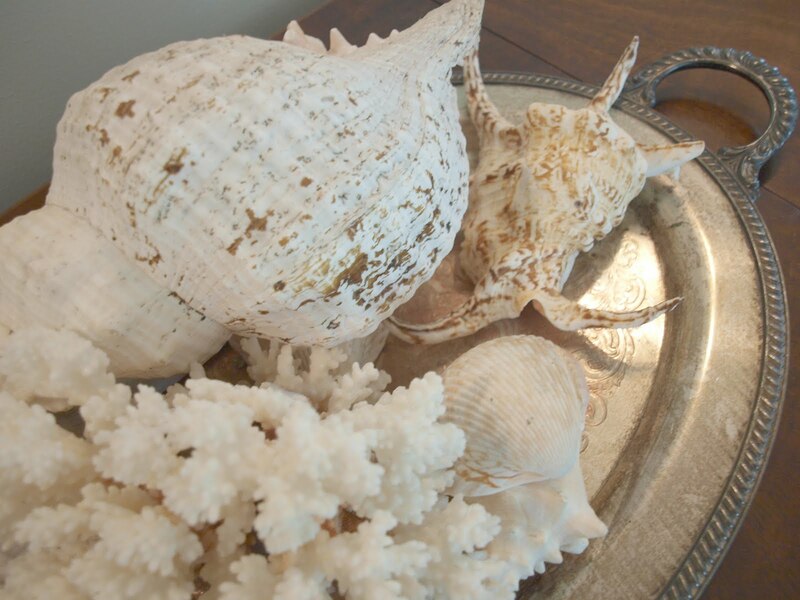 I love your shells and coral on the silver tray. I am coming over from Suzanne's at Privet and Holly. We don't collect anything; however, we are inspired to begin after this post. We love vintage jewelry. Your rosaries are beautiful. Angela has lots of antlers in the barn. The guys in her family give them to her after hunting season each year. (guess that a collection) Just let us know if you need some. Hope you day is great. I always thought it was you on the ballet slippers. Interesting! I am also a shell collector and love anything to do with the oceans and try to reflect that in my home in Kansas. I get to the beach at least once or twice a year to refuel my soul. Lovely post. Lovely lovely lovely collections. You have an incredibly inspiring way of putting things together. Living in a tiny house means collections are kept to a minimum, but I have mini collections of glass bottles, candlesticks and shells. 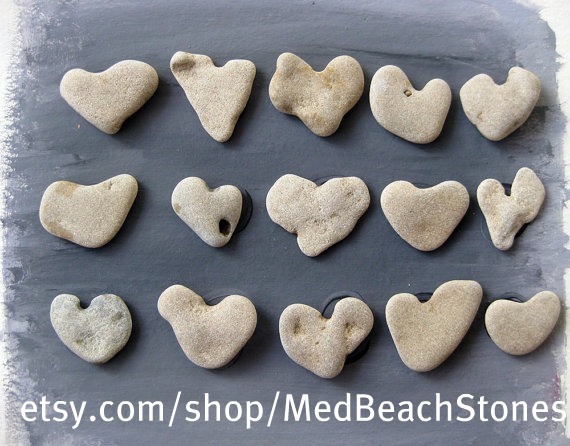 Those heart-shaped pebbles are cute! Love to you, sweet lady, and thank you for the tranquility and inspiration I feel every time I visit. I love the heart shaped stones. I do not have a rosary necklace but have always liked them and certainly see the beauty in them. a lucky day we connected! a lovey, too : ) !! Oh I love those sweet little heart stones!!! I collect too much! Rose dishes, linens, bird cages, books, ironstone just to name a few. I am visiting via Romantic Homes. Lovely collection! Thanks for sharing at Beach Cottage Good Life Wednesdays. What a lovely post! From the photos to the beautiful words, inspiring. Of course I love to collect too, so many things, many things are very sentimental to me. That's what drives most of my collecting. I love the printed English pots, and the rosaries so much! They all look so amazing together in your collage too! Thanks for linking up today, friend! Happy New Year sweet friend. May the new year bring you good health, much love and happiness and limitless blessings. Happy new year! nice post! Love your sea shells/coral and the English pottery jars. Michelle, I'm a hopeless collector. So many things call out to me. I have a group of heart shaped rocks that I've collected through the years. Fun to see yours. I also have an English marmalade crock, and would love to add more. Added a group of French mustard crocks on a recent trip to Dijon, France this fall. Yep, things just follow me home! You have beautiful, unique collections!